Description: Up for sale we have a wrought iron 5 light candleabra. It is 62" by 4". Description: Up for sale we have an antique metal bread box. It is 14" tall by 17 "wide by 11" deep. Description: Up for sale we have a 1920's bread box. It is 8" tall by 13 1/2" wide by 9" deep. Description: Up for sale we have a HUGE standing brown bear with a fishing pole. He is 46" tall 18" wide and 11" deep. Description: Up for auction we have a chalkboard sign from a meat market in Gary,IN. It is 63" long 25 1/2" tall and 1 3/4" deep. Description: Up for auction we have My Enemy My Friend an original story by Robert A. Sogg. Screenplay by Mikel Salena. It is 100 pages long. Description: Up for auction we have a lot of political ribbons and badges. There are 9 ribbons with buttons and badges. They range from 1926 to 1970. Description: Up for auction we have a wooden Upper Cut cigar box containing 30 unsorted political buttons. The box is 3 1/2 " tall and 7" long and 4" deep. Description: Up for auction we have a framed ribbon from the Illinois & Michigan canal opening celebration on July 4,1836. The frame is 5"by7". 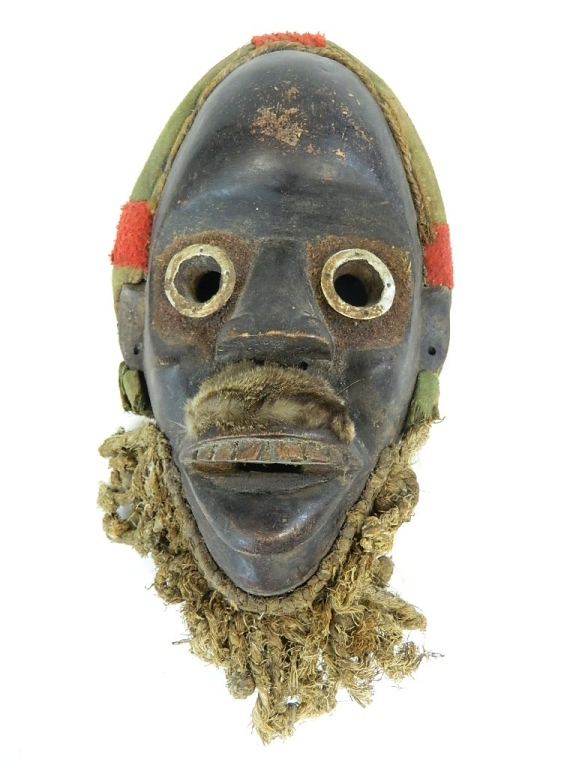 Description: African Wood mask with eyes outlined in silver metal and metal teeth. Mask is 10" High and 14" with hair x 6" wide. Description: African mask 16" H x 11" W carved of brown wood that is inscised with lines that are filled with a white earth material. Description: Up for auction is a colorfully painted Mexican wall mask in festive colors of green, orange, red and black. It measures 12" H x 8.5"W.
Description: Antique chinese drill from the early 1900's made of metal, wood and string, 17" H x 9.5" wide. Description: African mask wearing a green and red headband around head with eyes outlined in metal, wearing an animal fur mustache and rope like beard. 11"H x 6"W.